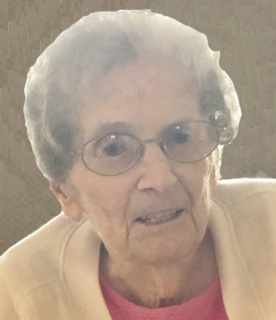 Marion J. Hoffman, age 93 years, of West Bend, passed away on Monday, April 1, 2019 at Serenity Villa in Slinger. Marion was born on November 4, 1925 in Minneapolis, MN, to the late Stanley and Austrid Phillips (Anderson). Marion was united in marriage to her high school sweetheart, Richard G. Hoffman, on July 15, 1948 in Minneapolis, MN. Marion was a loving wife, mother and grandmother. Marion and Richard relocated the family to Minneapolis, Duluth, Chicago and Milwaukee as the result of Richard’s job transfers. After Richard retired in 1981, the couple enjoyed golfing, playing bridge, and traveling. Richard and Marion moved to West Bend in 1993. Together they celebrated 57 years of marriage. Richard passed away on November 12, 2005. Marion is survived by her three children, Susan (John) Conwell of West Bend, Judy (Dean) Smith of Madison, and R. Scott (Denise) Hoffman of Coral Springs, FL; six grandchildren, Sandra (Patrick) Ebel, Christine (Donovan Roberts) Conwell, Jennifer (Andrew Timm) Conwell, Scott Conwell, Jeremy (Katie) Borens and Justin (Janicke) Stramer-Smith; nine great-grandchildren, Lauren and Erik Ebel, Shania and Austin Martinez, Braeden and Caylee Conwell, Audrey and Catherine Conwell, and Sofia Stramer-Smith; and special niece, Nancy (Dennis) Butler. She is further survived by nieces, nephews, cousins, other relatives and friends. In addition to her parents, Marion was preceded in death by her husband, Richard; two sisters, Betty (Roy) Walters and Carol (Warren) Vanderlinden; and sister-in-law, Mabel Montgomery. In accordance with Marion's request, private cremation services were held. Memorials to Serenity Villa (1600 American Eagle Dr. – Slinger, WI 53086) or charity of the donors' choice in memory of Marion would be greatly appreciated. The family would like to extend their heartfelt appreciation to the staff at Serenity Villa for the loving care they provided. The Myrhum Patten Miller & Kietzer Funeral Home of West Bend has been entrusted with Marion’s arrangements. Additional information and guest book may be found at www.myrhum-patten.com.